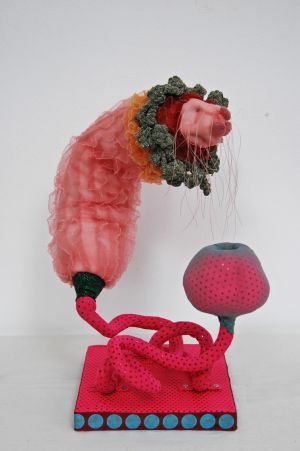 Much of my art is created with dyed stockings stuffed with polyfill. 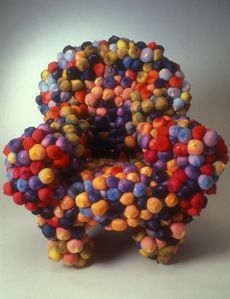 Early pieces include resin chairs covered with hundreds of brilliantly colored nylon stocking balls. After the chairs, I began creating wall hangings using many of the same materials. 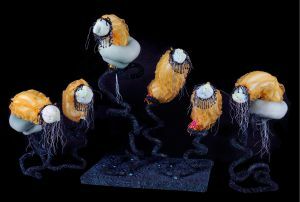 My latest pieces, titled Three’s Company and Do What? !, are both kinetic and participatory. 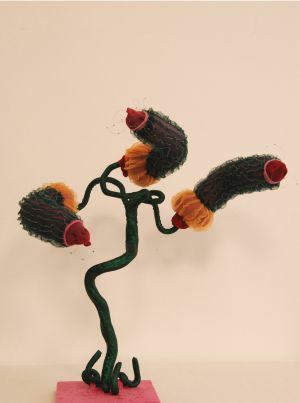 They are created using flexible wire covered in fabric. The heads are made of stockings, fabric and polyfill. These pieces are designed to be reconfigured by the viewer. They will sway when a fan is directed on the them. Works in progress include Auduino computers that enable the pieces to move independent of the fan. Originally from Louisiana, Applegate has been a resident of Los Angeles for the last 50 years. She has been able to successfully combine her profession as an educational psychologist with her art practice. During her years as a psychologist and special education specialist, she was awarded two grants from the Los Angeles Cultural Affairs Department. The first grant included an after school art program she designed for learning disabled students. The second grant was awarded in 1992 following the Los Angeles civil unrest. This was a community-based art collaborative program that was designed to help reunite the ethnically diverse community.